Don: what is the extent to which we’re allowed to plagiarise, 17% or something? Mark: No, it’s just like 20%, but I mean that’s all with just the bibliography or literally a couple of words which they highlight and you just ignore that, but obviously if you’ve got a paragraph then…. 1. It potentially changes the relationship between student and teacher, especially in terms of academic trust. 2. It increases the sense of writing as a product. In routinely processing assignments through third party PDS the students are further removed from the connection they have with their departments. Assignments become digital artefacts, uploaded to the PDS which becomes the sole arbiter of of what is ‘allowable’ when it comes to plagiarism. Instead of using drafts and ‘process-oriented’ writing, which encourages peer- and self-review, process and drafts are subjugated to the technology. Students are creating a product – a commodity to be judged. With PDS ‘plagiarism’ becomes simply about copying text, and about percentages. This is not helped by, for example, the colour coding system in Turnitin. The ‘similarity index’’ is either blue (no matching words); green (up to 24% similarity); yellow (25-49%); orange (50-74%); or red (75-100%). So, you can plagiarise up to 24% and you get a green light! And green means good to go, right? Discussions of plagiarism are fraught at the best of times, but PDS adds more weight to the discourse of plagiarism as ‘fraud, transgression, control, immorality, and dishonesty’. It ignores the complexities that are involved when people are novices, when they are writing in a new language, or educational context, or subject. It ignores the nuances of scholarly discussion, or of different disciplinary and linguistic contexts. 4. It promotes a view of writing which demonstrates little awareness of the potential of digital technology for multimodality, and new ways of presenting academic texts. PDS are premised on an increasingly outmoded ‘print literacy paradigm’. This fails to acknowledge the potential for digital technology to be used for multimodal and hyperlinked texts. PDS is based on matching text (it is actually text matching software, not plagiarism detection software), so cannot assess ‘images, animation, colour, or other modes of meaning-making’. PDS may have the effect of discouraging such novel forms of scholarship and expression. It’s not all bad. In an age of massive amounts of online material, PDS obviously helps to spot potential plagiarism quickly and efficiently. Simple practical measures to address misunderstanding plagiarism would include teaching students what the ‘similarity index’ in Turnitin actually means, and how the index can be interpreted. 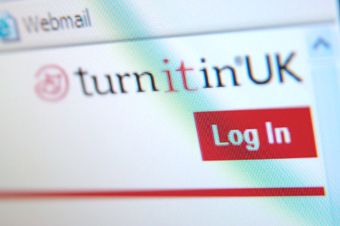 Turnitin has a feature which allows drafts. The similarity index can then be used as an aid to teaching about plagiarism before the final draft is submitted – that it’s not just about copying and percentages, or how much plagiarism is ‘allowed’. Encourage students to reflect on the processes of their own learning by discussing the sorts of political and moral arguments about educational technology that McKenna and Hughes have highlighted. Each social science subject area should be able to contextualise the arguments about the uses of educational technology in this way. McKenna, C, Hughes, J. (2013) Values, digital texts, and open practices – a changing scholarly landscape in higher education In Literacy in the Digital University. Critical Perspectives on Learning, Scholarship, and Technology R. Goodfellow and M. Lea (eds) (pp. 173–184). London: Routledge.